Behind the scenes installing at Yaletown-Roundhouse Station Canada Line — at Yaletown–Roundhouse Station. Wendy is the story of a fictional young woman living in an urban centre, who aspires to global success and art stardom but whose dreams are perpetually derailed. The position of the underdog, outsider and shape shier is central to this body of work and the influence of feminist icons such as Elle Woods in ‘Legally Blonde’ or artist, punk poet, experimental novelist and filmmaker Kathy Acker lingers. 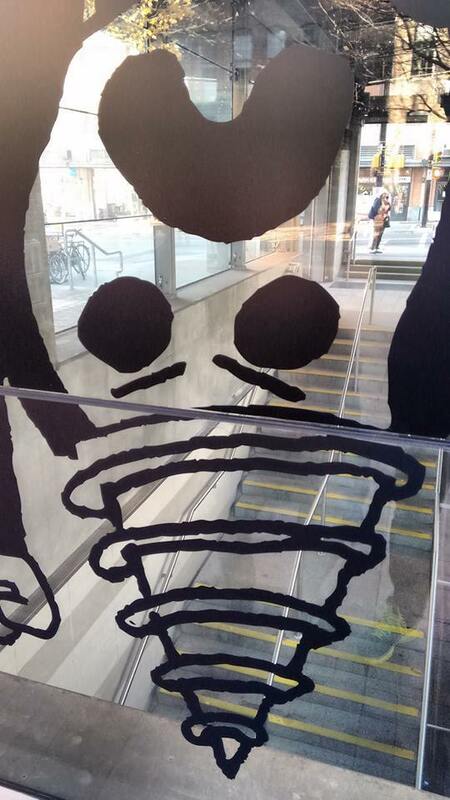 Scott’s two-panel installation at Yaletown-Roundhouse Station, “A Home Underground (Excerpt II)” evolves from a new Wendy volume in which the eponymous character moves to Vancouver. Evoking the malaise of urban life, we see Wendy pictured moving through the city, a foil or reflection of the daily commuter passing through the station. Considering the two possible viewing positions for the work, inside the station descending the stairs or outside walking by, Scott has developed a recto-verso installation referencing the alter-ego/duality Wendy embodies, and the antagonism between mind and body. In this case, Wendy navigates Yaletown on her smart phone, juxtaposed with her inner self drilling head first into Vancouver’s sub terrain — a representation of existential frustration.